SMTP stands for Simple Mail Transfer Protocol . The System.Net.Mail namespace contains classes used to send e-mail to a SMTP server for delivery. The default port using SMTP is 25 , but it may vary different Mail Servers. The two classes here we are using for sending email are MailMessage Class and SmtpClient Class. The MailMessage class represents the content of a mail message. The SmtpClient class transmits email to the SMTP host that you designate for mail delivery. The following ASP.NET source code shows how to send an email from a Gmail address using SMTP server. The Gmail SMTP server name is smtp.gmail.com and the port using send mail is 587 and also using NetworkCredential for password based authentication. 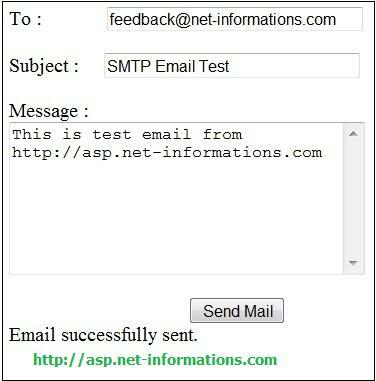 The following ASP.NET program using a gmail address as from address and server as gmail smtp server for sending a SMTP email message.